Rotator cuff injuries are not uncommon in golf. Your golf game would be pretty bad without help from your rotator cuff. The rotator cuff comprises a group of muscles and tendons that not only connect the arm bone to the shoulder but also helps hold the upper arm bone ball in the shoulder socket. The power in your golf swing doesn't come from the outer deltoid muscles but instead from the muscles that make up your rotator cuff. So if golf is your game it's important that you are aware of any unusual symptoms affecting this vital part of the shoulder. Pain is a warning sign that something is wrong with your rotator cuff. You'll feel a general low pain and tenderness in the shoulder area when it is torn. Lifting the arm, putting it behind your back, sleeping on it and pulling on it will worsen the pain. If you feel weakness, no matter if it comes from lifting something or just by squeezing your hand into a fist, you might have something wrong with your rotator cuff. Your arm may not move properly from an injured rotator cuff. Because it's such an important group of muscles and tendons when it comes to circular arm motion, any injury to this vital area could result in a loss in motion in your arm. 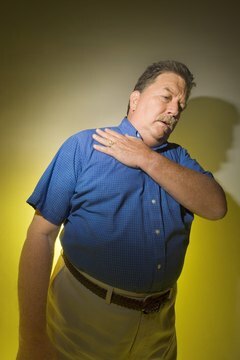 Certain symptoms require a visit to a shoulder specialist, according to the Mayo Clinic. If pain is severe at the point where it interferes with sleep or function, if the arm become immobile or if pain lasts for more than a week, you need to see a doctor.